We are delighted to announce that Richard Murphy Architects have been appointed to adjust the design for the conversion of Donaldson’s School in Edinburgh as well as design a residential development within the grounds. The practice successfully achieved a previous planning permission in 2005. The site is being undertaken in partnership by two developers each of whom have appointed the practice for their respective sections. City & Country is responsible for the restoration and conversion of the Grade A listed former deaf school designed by William Playfair into a range of residential apartments whilst CALA Homes will be constructing new apartments on the north side of the site. Richard Murphy Architects are now working on a combined revised design to enhance the existing planning approval for the entire site which is expected to be submitted this Spring. 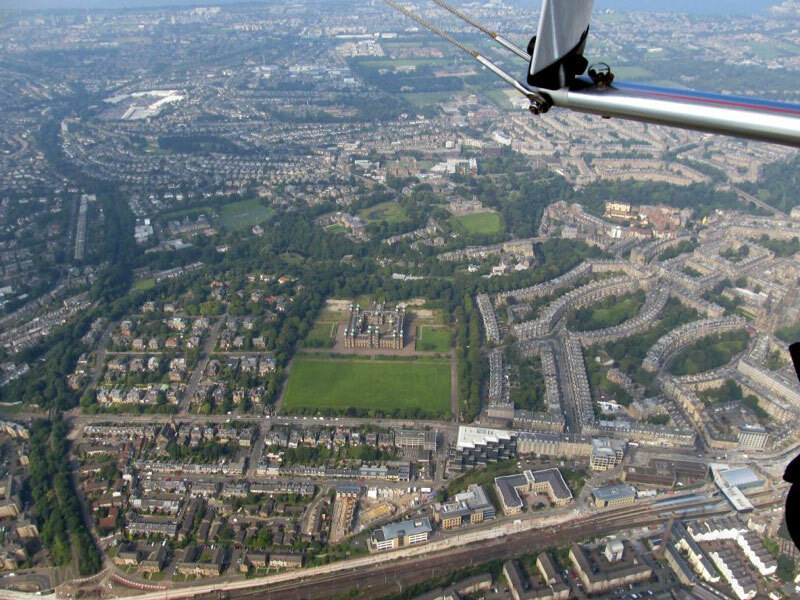 The aerial photograph was taken from Richard’s microlight. Won in limited competition in 2008, we are delighted that the project is now officially under construction. The contractors are BAM Construct UK Ltd, procured through Fife Council's “hubco” system and the contract value is £9M. 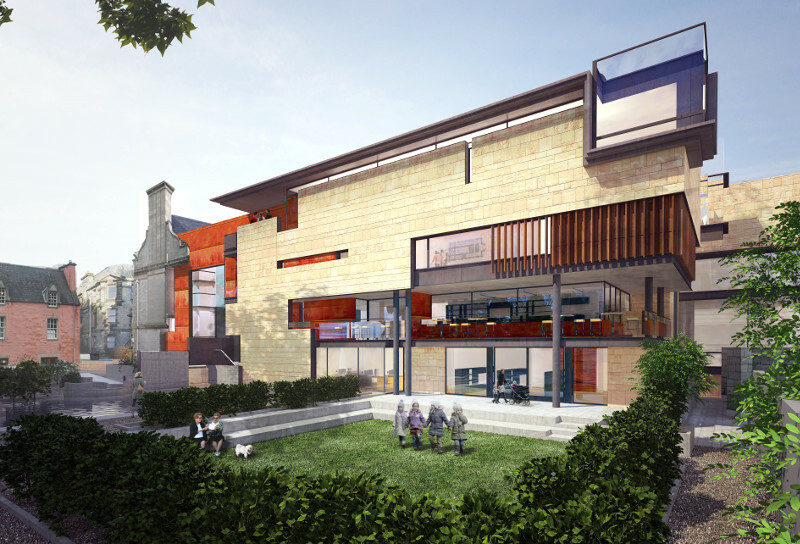 The project sits between three of Dunfermline’s most important historic buildings: the Abbey, the Mediaeval Abbot’s House Museum and the world’s first Andrew Carnegie Library. A completion date of autumn 2016 is anticipated. 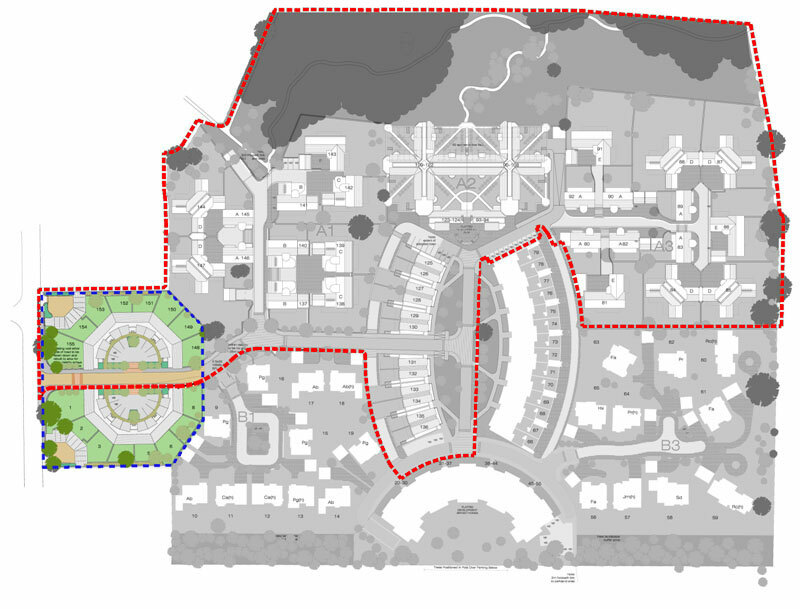 AMA (New Town) Ltd have commissioned us to complete the last section of their prestigious housing project at Cramond. An octagon of terraced housing forms a gateway to the development which features courtyards, apartments and individual houses - many arranged around shared courtyards. This project began in the office in 2000 and is expected to be finally complete in May 2016. Maggie's Centre in Edinburgh was featured as one of the recent “100 Buildings: 100 Years” Exhibition held at the Royal Academy in London. 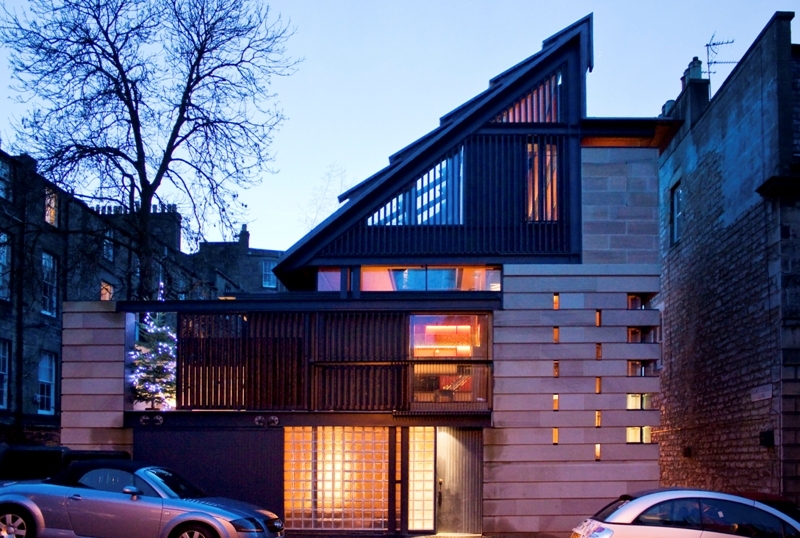 Organised by the Twentieth Century Society with an accompanying publication, Edinburgh Maggie's Centre was 1996’s building. 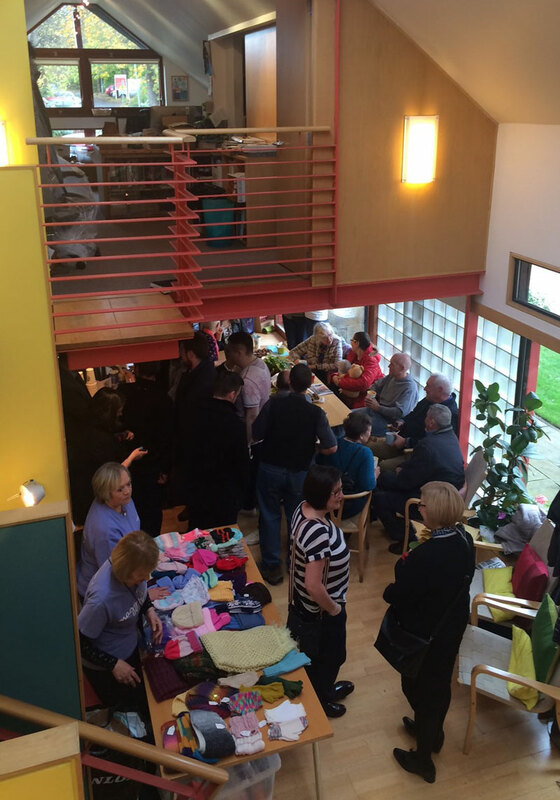 The picture shows part of the recent celebrations marking the eighteenth anniversary of the Centre opening. A proposal for a second extension will shortly be submitted for planning permission. Richard Murphy has moved into his new house at Hart Street, Edinburgh. Although not entirely complete he is welcoming visitors. Interior photographs will be published in our next newsletter. The structural frame is now complete with the steel roof structure added recently over Christmas. Work continues at pace to install glazing and complete the building envelope; mechanical and electrical first fixes are underway and the installation of new stone cladding will commence shortly. Edinburgh Academy new hockey pavilion is now half way through a six month construction period, due for completion at the end of March. 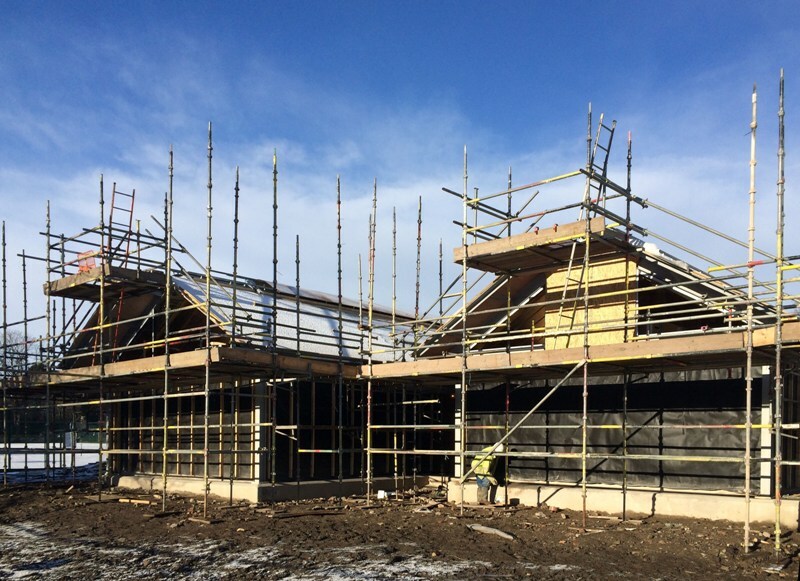 The main frame, external walls and roof have now been erected with internal works commenced at the beginning of January. The refurbishment and extension of the Rugby pavilion is currently out to tender, tender returns expected at the beginning of February with a site start to follow the completion and occupation of the Hockey pavilion. Both Phases 2 and 3 at Young street are 44 weeks into the construction period with a further 26 remaining. The main structures are now erected with roofing and curtain wall glazing almost complete. The skeleton steel work of the Phase 3 chimneys are now in place and the full extent of the continuous elevation to New Street is starting to emerge. 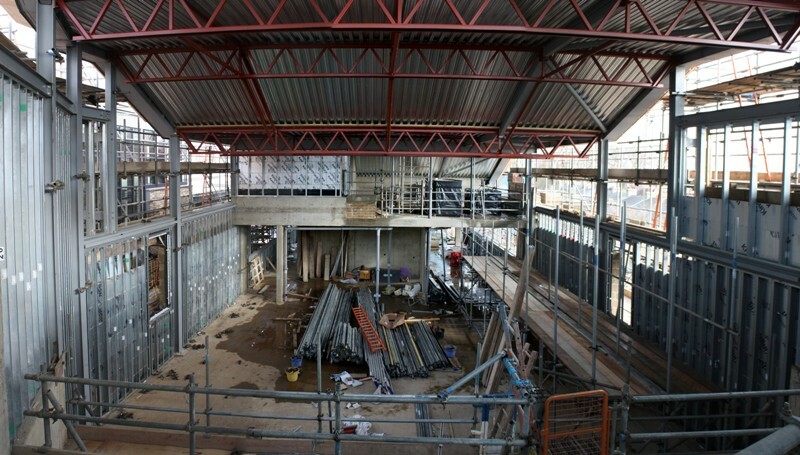 The image above shows the Phase 2 lecture theatre space starting to take shape with clerestory glazing commencing shortly. Richard has been invited by the Iceland Academy of Arts Architecture School on the 17th March at 12 noon in Reykjavik to talk about the work of the practice and also to give a lecture about the work of Scarpa. Richard spoke at the RIBA in November at a Research Symposium about designing for dementia care. He was partnered by Ricky Pollock of the Stirling University Centre for dementia and together they discussed the two buildings completed about four years ago by the practice at Stratheden hospital near Cupar in Fife. Richard contributed an article to a commemorative book published by the Castelvecchio Museum in Verona to mark the fiftieth anniversary of the reopening of the museum as re-designed by Carlo Scarpa in 1964. Urban Realm in its newsletter of 16 December reported that our Dunfermline Museum & Art Gallery has moved on site. Councillor Helen Law said – “This is a hugely ambitious and exciting project for Dunfermline” and “The facility will bring an impressive new focal point to the Heritage Quarter and wider town centre".In November, Urban Realm also reported our proposed Cambridge Science Centre for Anglia Ruskin University. The second RSA Metzstein discourser will be the celebrated Australian architect Glenn Murcutt. He is coming to Edinburgh on Tuesday 19th May 2015 and speaking in the University of Edinburgh George Square lecture theatre at 6.30pm. Tickets will shortly be on sale at the RSA. Richard is writing a commemorative booklet to be published for the event. Congratulations to Peter Guthrie and Tina Bergman who have just recently tied the knot. They met when both of them were working in the office eight years ago. Peter is now one of the world’s leading architecture computer visualizers. 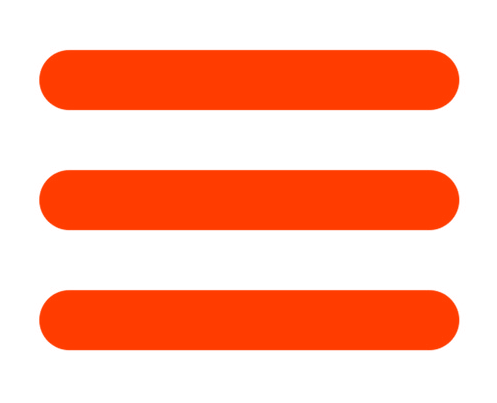 His amazing work can be seen at http://www.the-boundary.com and http://www.peterguthrie.net/blog/2014/10/introducing-the-boundary. Tina is running her own practice in London. Undoubtedly the best Christmas card from 2014 came all the way from Budapest from Zoltan Kiraly (who once worked with us) and his wife Maria. 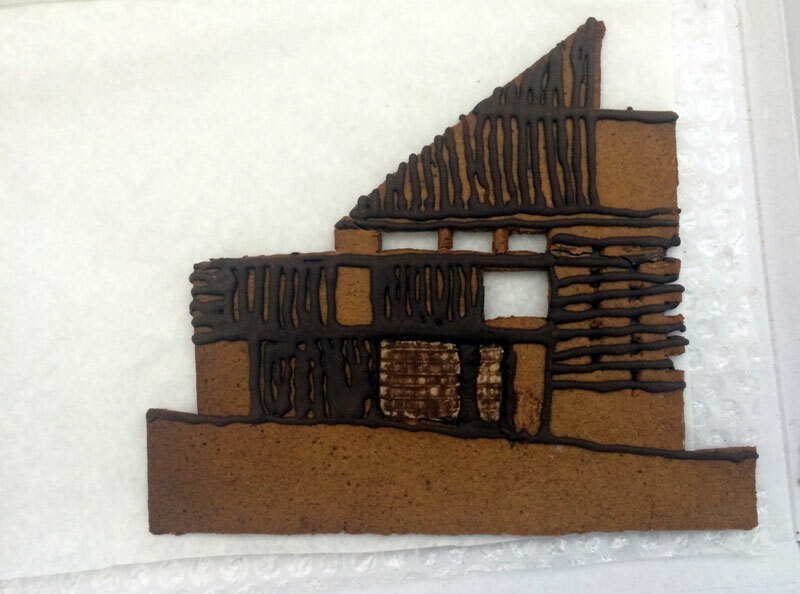 They sent us a gingerbread house superbly modelled on 2B Hart Street. Just too good to eat!